The Hotel Gibbs is an upscale hotel, lovingly and carefully transformed in 2009 from a turn of the century office building to a magnificent luxurious boutique hotel catering to travelers seeking to explore Texas’ independent history. The current architectural design seamlessly blends the hotel’s distinctive art-deco charm of scrolled marble accents and gilded hanging chandeliers with its ghosts of prior business establishments from a time nearly forgotten. The lobby still holds the address board listing a few of the prominent businesses and their location in the building in addition to the original water fountains and large room safes located on each floor in the hallway. When you visit: Make a point to visit the second-floor safe just outside of the elevators. When you open the safe door make note of the weight of the safe and the original safety deposit boxes that were available for the businesses to use. The amenities available in this upscale boutique hotel are reminiscent of what you may expect to find at an all-inclusive resort – pillowtop mattresses, finely woven Italian linens, thick and thirsty towels folded into decorative designs. Complimenting each room is a Keurig coffee center with an assortment of coffees, free WiFi, flat screen tv, boutique spa bath products, and original solid hardwood floors. Additional amenities include a hot breakfast buffet with eggs, sausage, biscuits, fresh fruit, and of course, their signature breakfast tacos. Wash all that down with bottomless coffee, and you are ready to explore the streets of San Antonio. I would recommend you take a Riverwalk cruise. Know before you go: As with most hotels near the Riverwalk, parking can be a challenge. Hotel Gibbs offers valet service for roughly $30 a day. If you do not plan on driving your car while visiting the Riverwalk, there is a paid parking lot adjacent to the hotel for about $20 a day. As They Say At Hotel Gibbs, every hour is happy hour. The 1909 Taproom commands a prestigious corner location with two solid walls of windows. With an unobstructed view of the Alamo, 1909 an ideal place to people watch as you sample craft beer and Texas wines. The friendly hospitality of Hotel Gibbs is such that if you lose track of time while you are people watching (which we did), they will not rush you out at closing time. It was just the opposite in fact. The bartender told us just the opposite – don’t rush, take your time. This casual and welcoming comment surprised us. Indeed, they raised the bar. Location. Location. Location. The Hotel Gibbs is conveniently located for exploring San Antonio’s nightlife, the Riverwalk, and gourmet restaurants without the need of a car. Frequently, when a luxurious boutique hotel is conveniently located, that perk can be reflected in the cost of the room. Considering all the conveniences offered, Hotel Gibbs is an excellent choice to rest your adventurous spirit in San Antonio. When we booked the room, Josh from the hotel contacted nearly immediately via email. He welcomed us and asked if there was anything we needed for our upcoming stay. In an age when individualized customer service is a rarity, particularly in a field such as the hospitality industry where there is a steady stream of travelers through their lobby, the personal touches that Hotel Gibbs freely gave was truly welcome indeed. It left us with the feeling of visiting an old friend. 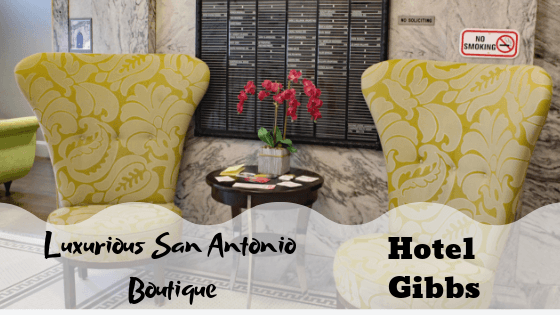 If you are planning a trip to San Antonio, the Hotel Gibbs would be our recommendation for you. Check them out. Thank you for reading this travel nugget of knowledge about Hotel Gibbs, a luxurious historic boutique hotel. This article may contain an affiliate link or two, which does not affect you in any way, but will allow Empty Nestopia to continue to bring you travel tidbits. Love your blog on this most interesting hotel!! I will put it on my bucket list for sure. Thank you!! We love the uniqueness of the hotel and the personal touches from the staff. The room attendant even left a handwritten note on our nightstand.